The 78th McMullen Livestock Show hosted by the Tilden Livestock Scholarship Association was a huge success beating 2018 sales numbers with a total of $277,880. The 2018 numbers totaled $251,650. This outstanding two-day event showcased the hard work and commitment of the youth of McMullen County who dedicated countless hours to their livestock projects. Exhibitors showed animals in the categories of market steers, commercial heifers, goats, lambs, swine, broilers and rabbits. Each category was judged by qualified professionals appointed by the Tilden Livestock Scholarship Association (TLSA). One hundred percent of the 2019 participants sold their project in professionally managed auction on Saturday, January 26 with Boyd Grimshaw serving as auctioneer. Grimshaw who is a retired Agri-Science teacher has auctioneered for the McMullen County Livestock Show for an estimated 25 years. Prior to the sale there was some amazing showmanship beginning with Little Britches and continuing on through the selection of Grand Champions. If you have never attended the McMullen County Livestock Show please make plans to attend next year. You will be surrounded by youths that make you proud to be a Texan. Youths filled the show barn dressed in their best show garb and freshly cut hair with livestock that wowed the judges. Hard working, dedicated, mannerly, fun and quite a few with loads of charm and extra special showmanship – these are the best of the best future farmers, ranchers, agri-science and agri-business majors. 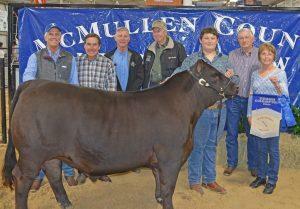 The McMullen County Livestock Show Grand Champion Steer went to Brannan Woelfel with his heavyweight steer. Bidding a total of $12,000 were buyers Walt Franklin with Atascosa Syndicate, Dave Valtierra, Marty Harris with San Miguel Syndicate, Bob Siddons with Beef Master Syndicate, and Tim and Shirley Jambers. Cross Smith’s Grand Champion Hog sold for $7,500 to Jason Jones with Schoolhouse Syndicate and Walt Franklin with Atascosa Syndicate. Allison Rowe’s Grand Champion Goat sold for $7,000 to Jason Jones with School House Syndicate, Stevo Franklin with San Miguel Syndicate and Matt Franklin with Atascosa Syndicate. Charity Harris’ Grand Champion Lamb sold for $7,000 to Steven Mafrige Y-Bar Ranch. Kelsey Gonzales sold her Grand Champion Broiler for $4,000 to Stevo Franklin with San Miguel Syndicate and Matt Franklin with Atascosa Syndicate. Amanda Selby sold her Grand Champion Rabbits for $3,000 to Walt Franklin with Atascosa Syndicate. For the second year in a row, Colton McCartney won Reserve Grand Steer which sold for $7,500 to Marty Harris with Tyler Ranch Properties and San Miguel Syndicate, Jason Jones with School House Syndicate and Katie Franklin with San Miguel Syndicate. Carsyn Woodin’s Reserve Champion Hog sold for $5,500 to Shirley and Tim Jambers and Dave Valtierra. Jayden Jones’ Reserve Champion Goat sold for $5,000 to Alan Brown with Max’s Cafe. Taber Garcia’s Reserve Champion Lamb sold for $4,750 to Jason Jones with School House Syndicate. Madison Sherrer’s Reserve Champion Broiler sold for $4,000 to Walt Franklin with Atascosa Syndicate and Mark Rambert with Saylee Salt Water Disposal. Ariana Coolidge’s Reserve Champion Rabbits sold for $3,000 to Francis Swenson with Swenson Ranches. The 2019 TLSA Board wanted to give a big thank you for the buckle donations by the following sponsors: Grand Champion: Rabbits, Siedel Construction; Poultry, Rancho Saylee; Swine, Kimberly Kreider Dusek; Goats, Ramsey Pate Landscaping and Irrigation; Lambs, Swenson Ranches; Steers, MA Tyler Cattle Company; Heifers, Mr. and Mrs. Martin Harris; Commercial Heifers, Y Bar Ranch. Reserve Champion: Rabbits, Donnie Haynes; Poultry, Donnell Family; Swine, TR and Christy Lansford; Goats, Lester Powers Ranch; Lambs, Texas Farm Credit; Steers, Langley Enterprises; Heifers, Langley Enterprises. Showmanship: Swine, The Location; Goats, Swaim Family; Lambs, Jennifer and Chris Turner; Steers, Jim and Ruth Marsh; Goat Little Britches, Free Flo Feeds; Swine Little Britches, McMullen County Sheriff’s Office. This year two awards of appreciation were handed out from the TLSA Board. The couple award went to Carlos and Vicky Casas who have invested countless hours to help youth in the community over a 10-year period. The board stated that at almost every function that is put on for this community, one can find these two giving a helping hand whether it be power washing, cleaning pavilion areas, loading animals, helping with the pee wee goat show, putting on clinics and just showing up whenever and wherever needed. The TLSA board says this couple goes above and beyond and they are appreciated. “We thank them immensely,” said the board. The second award went to Carl Almendarez who has been volunteering for 24 years with the Tilden Livestock Scholarship Association. During that time, he served on the Fair Board for several terms. “Carl has spent many endless hours helping children in the ring with animals during the auction as a ring man, and cooking briskets for the social. He has continuously dedicated his time to the association. “We thank you immensely and we will see you next year Carl,” said the TLSA Board. Please pick up next week’s issue of the Pleasanton Express for a photo collage from the McMullen County Livestock Show and more results and buyers information. The Pleasanton Express took hundreds of photos during the show that we will be happy to email for free this year to parents who are patient and will help identify their youth. National FFA Week kicks off February 17. As part of FFA week, the Pleasanton Express will be sharing photos all month to our Facebook page. You are welcome to copy and share with family and friends.